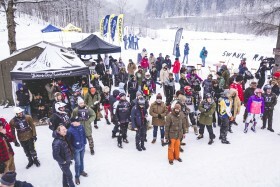 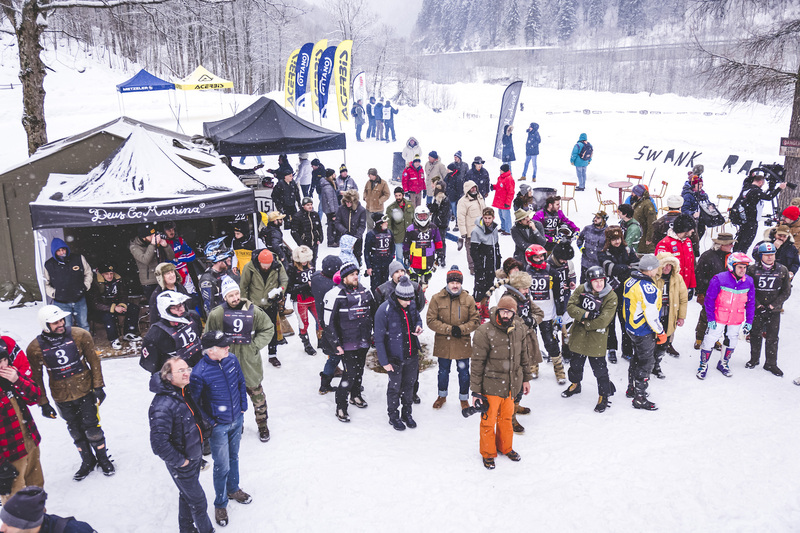 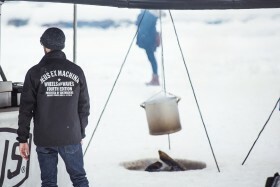 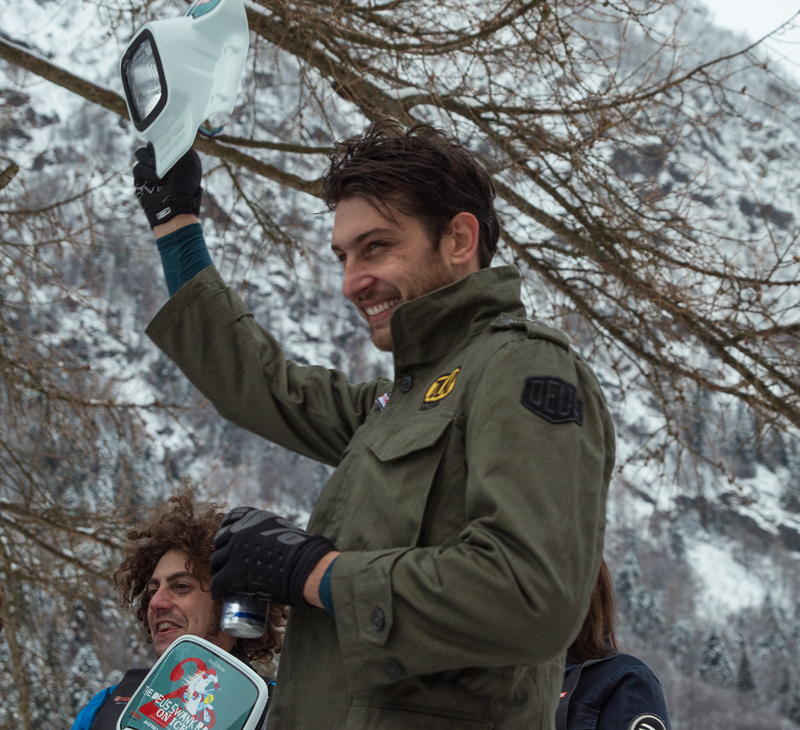 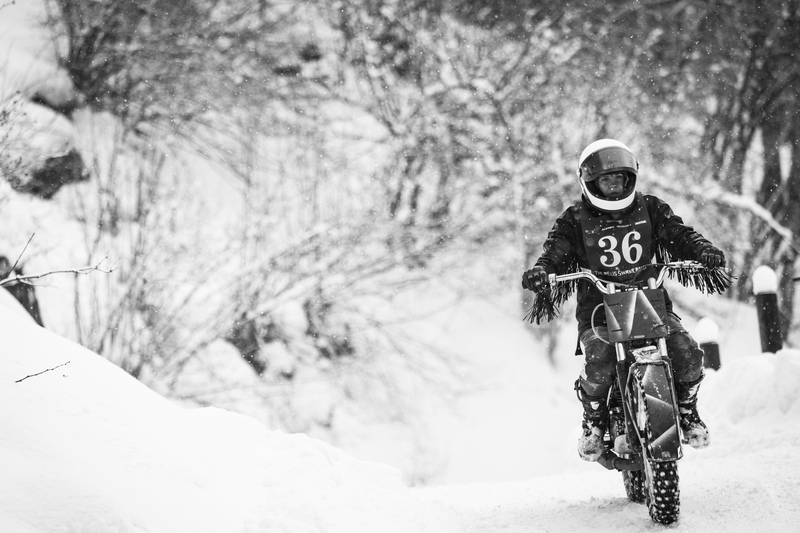 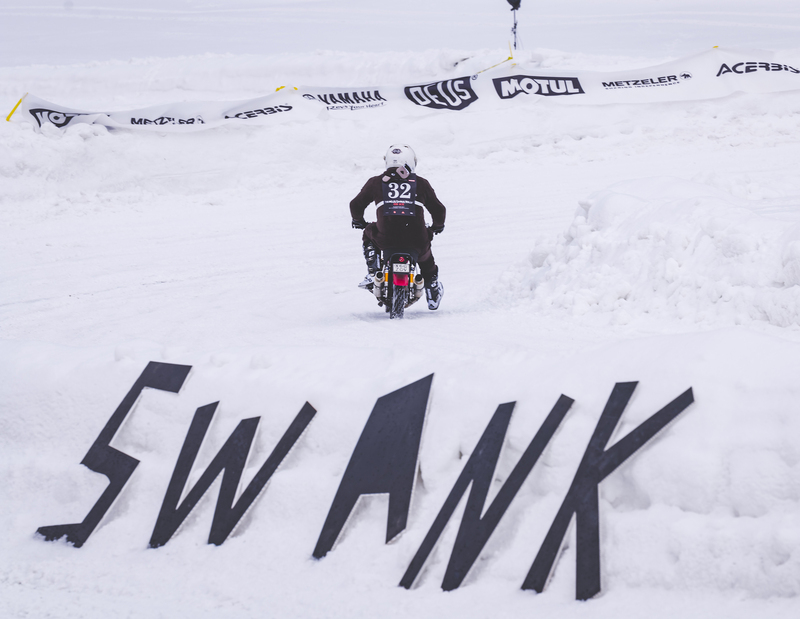 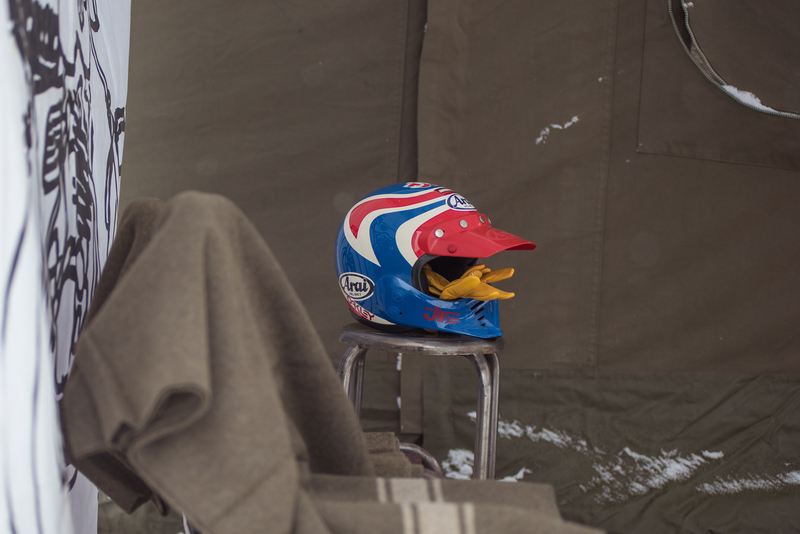 Swank Rally On Ice is one of those days when there is no yesterday and no tomorrow. 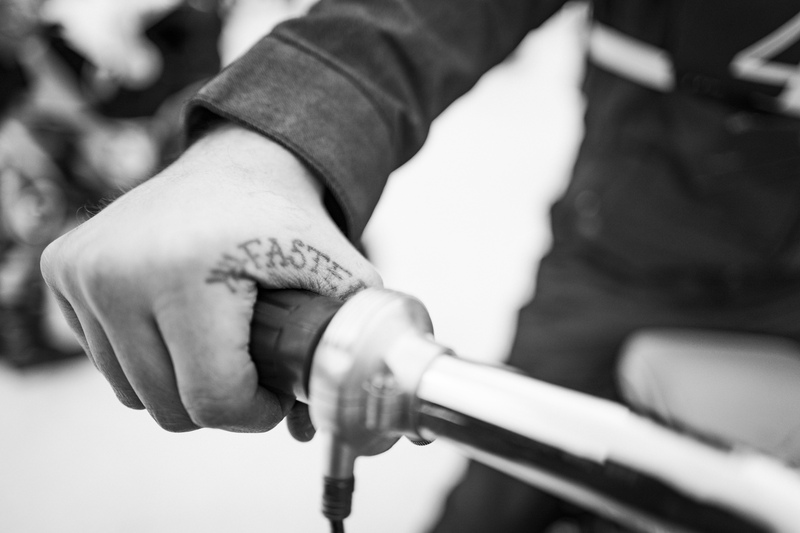 You leave behind everything, home, work, problems: there is only one challenge that matters, and the only friends you have are the spikes screwed onto your bike tyres. 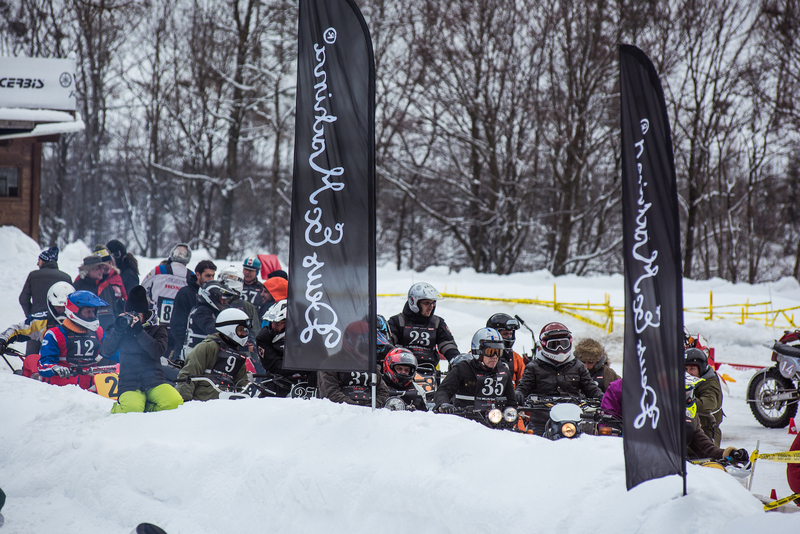 53 heroic riders from all over the world are challenging the ice of the Ice Rosa Ring on the unforgiving slopes of Monte Rosa at 4634m. 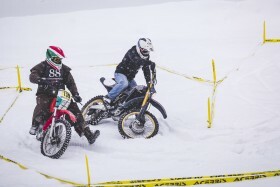 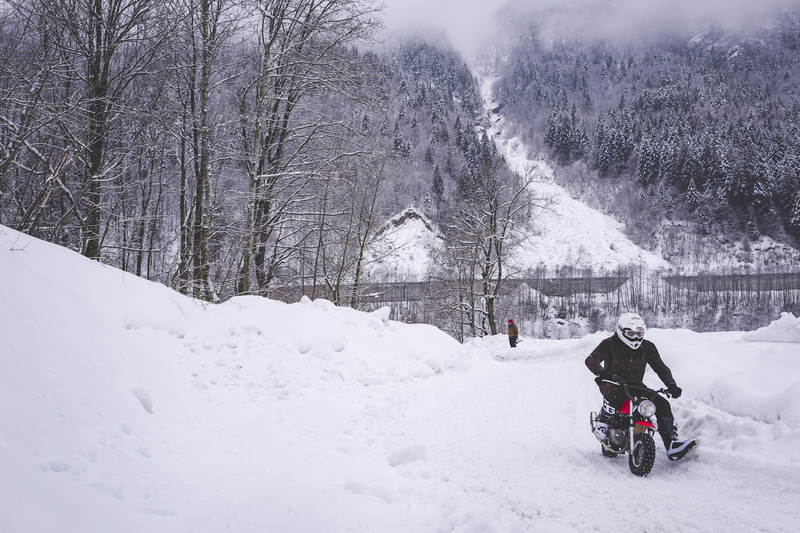 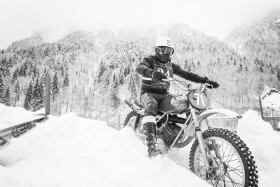 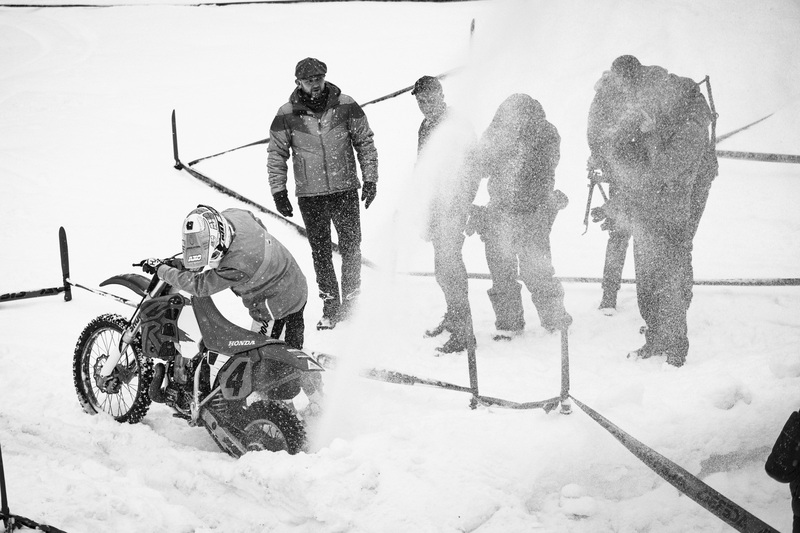 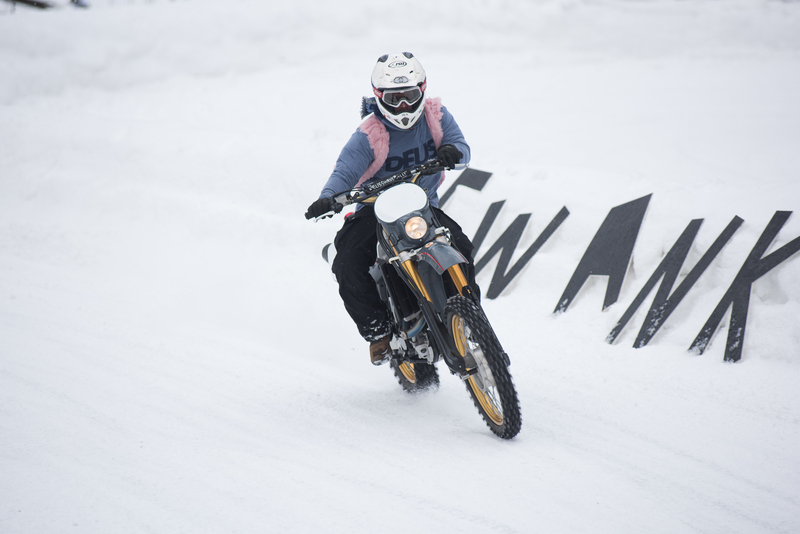 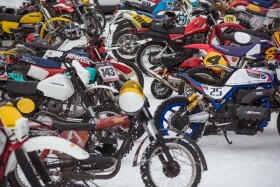 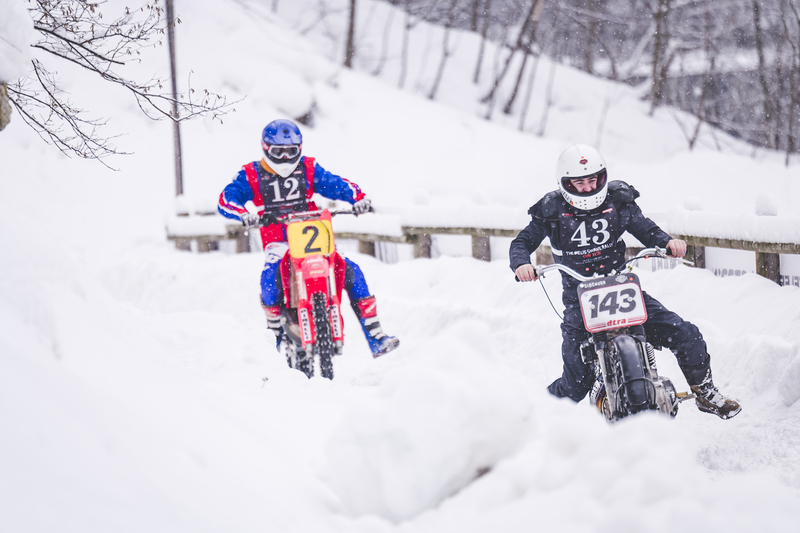 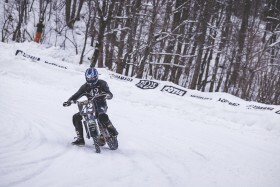 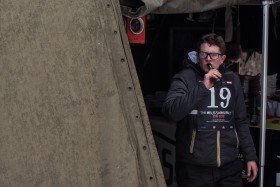 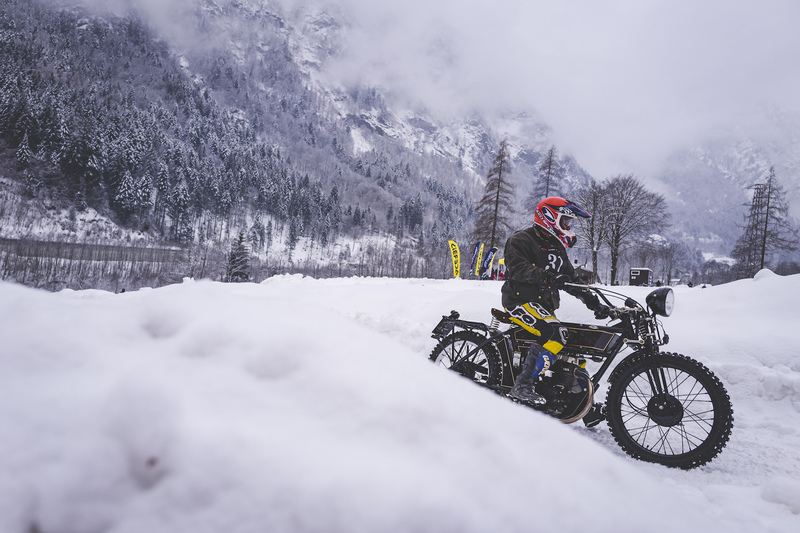 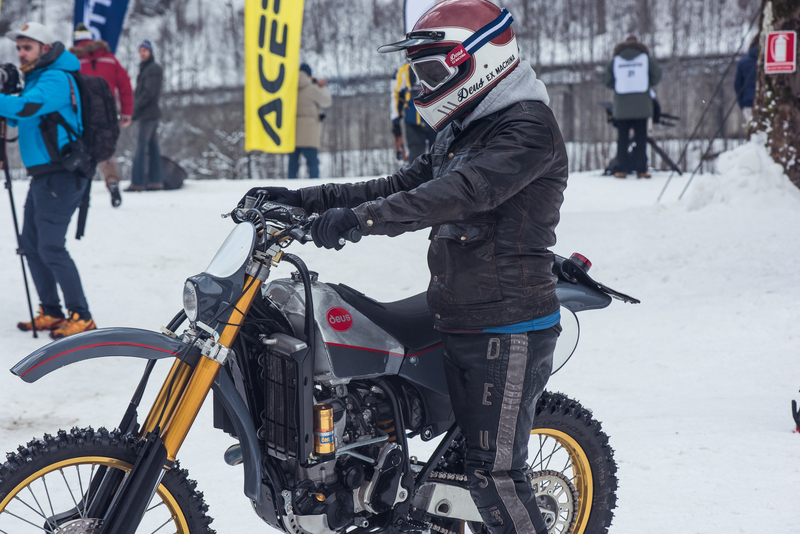 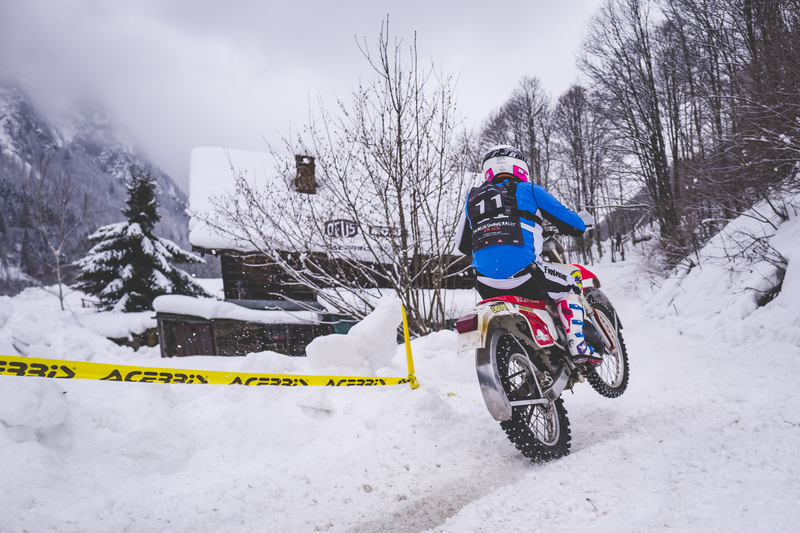 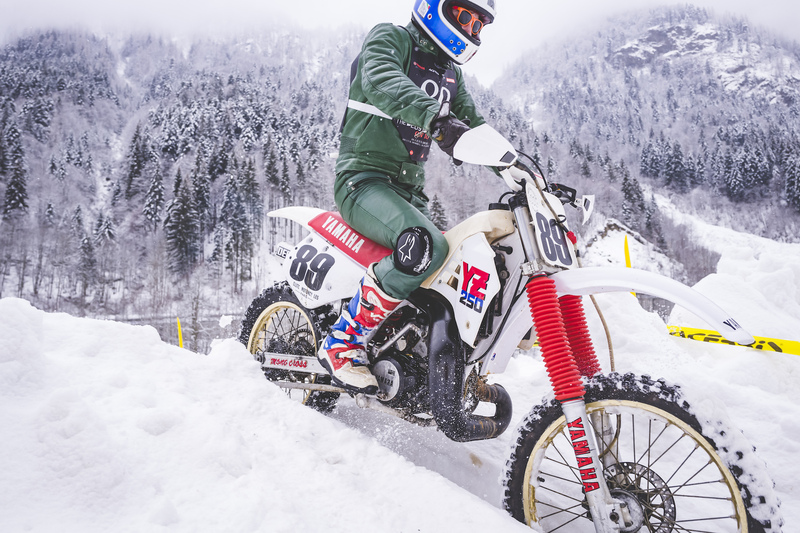 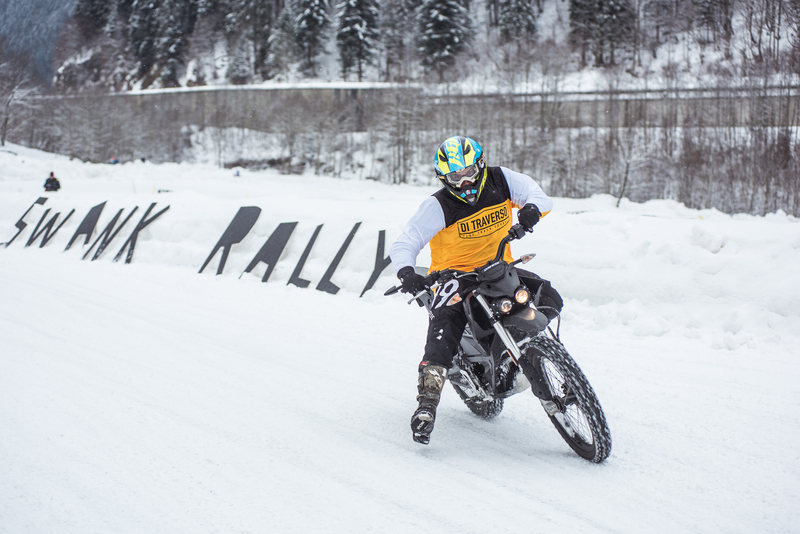 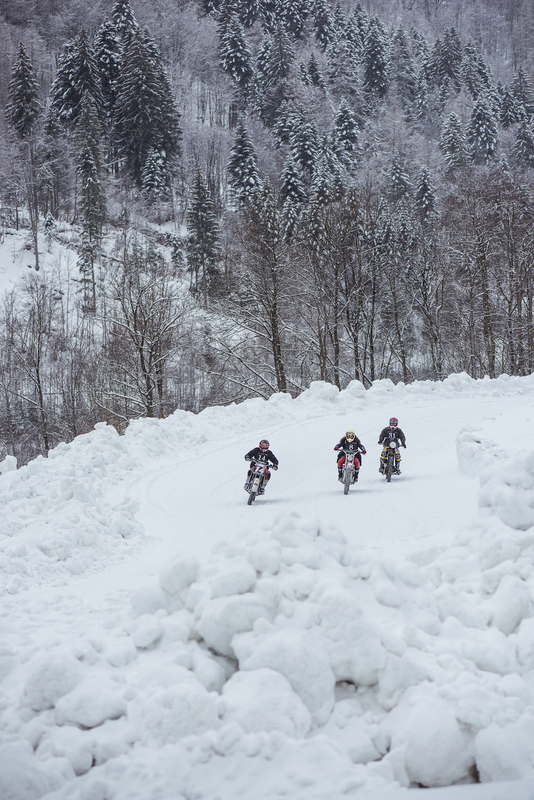 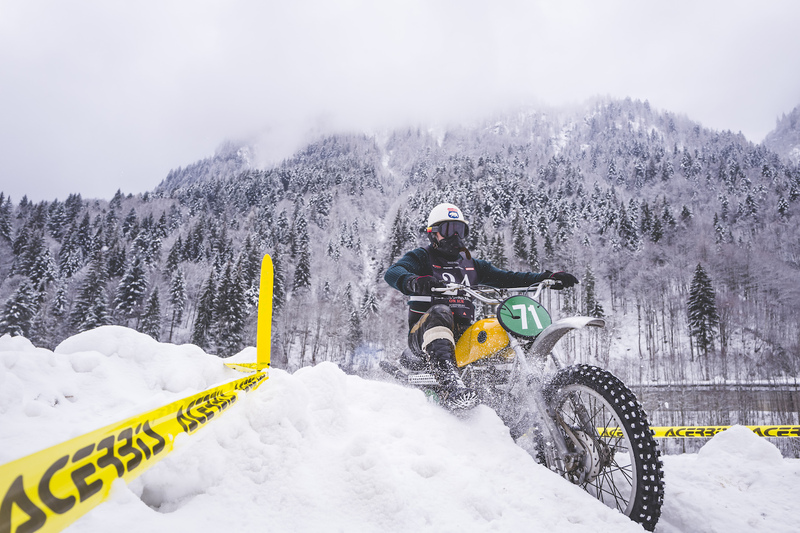 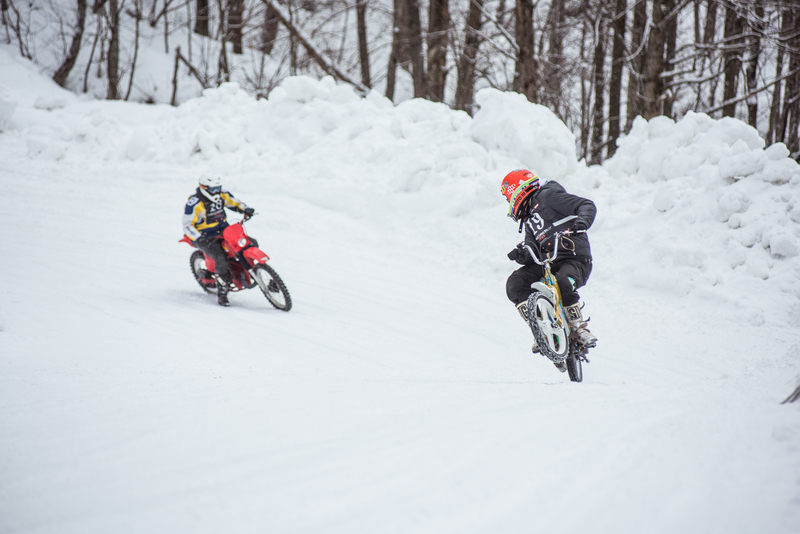 The engines have been revving since the morning’s practice session, where a track in the midst of fresh snow has had the better of many of the bikes taking part. 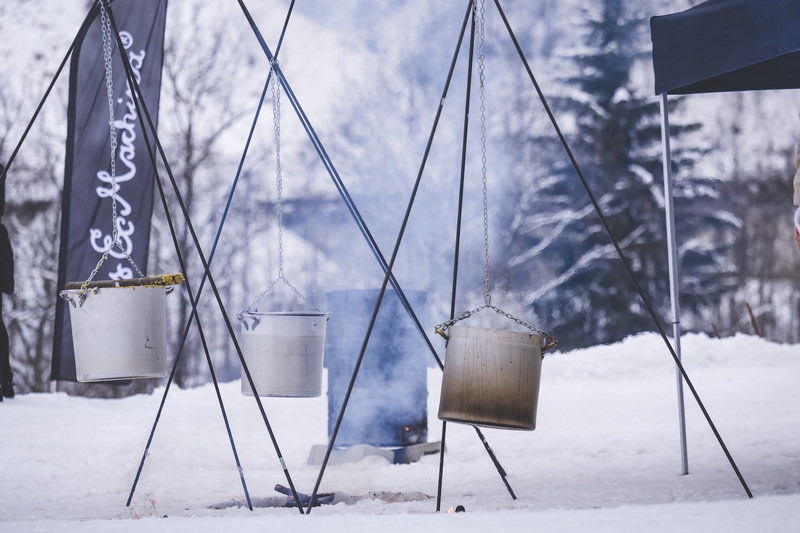 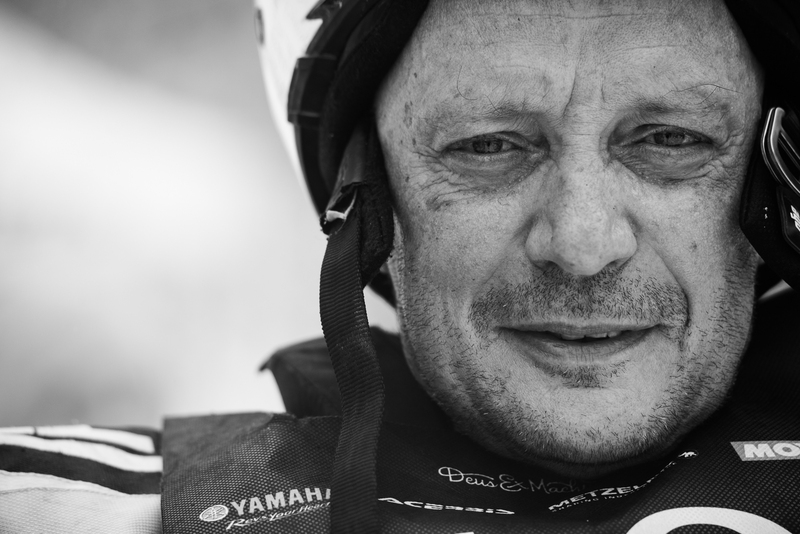 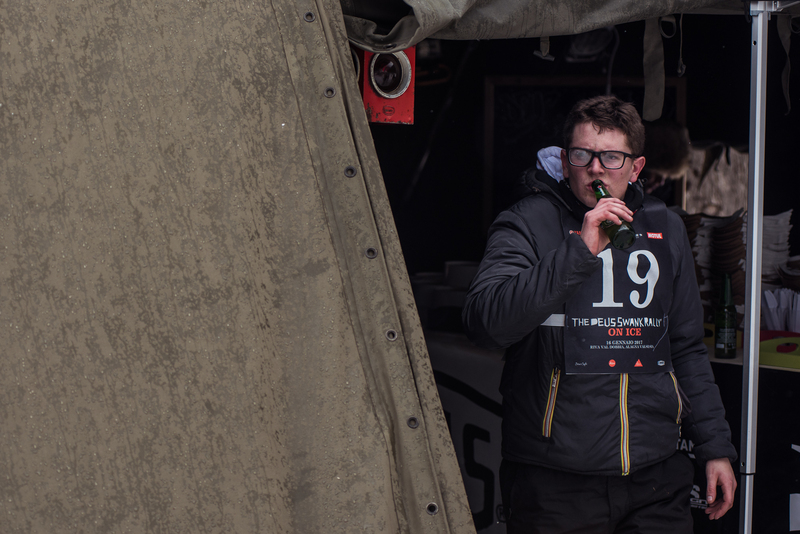 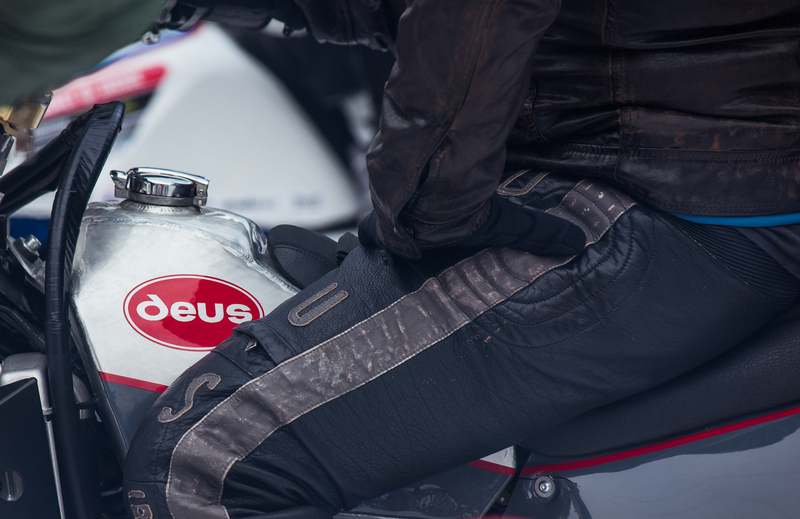 While the engines were warming up, and the race was being prepared with the help of the Di Traverso school, the staff of the Deus Cafe got the first sausages sizzling and were preparing to warm minds and bodies with mulled wine. When afternoon comes, Rock n ‘Roll counts down the minutes and fires everyone up for the self timed race, opened by the three girl superheroes who were among the contenders. 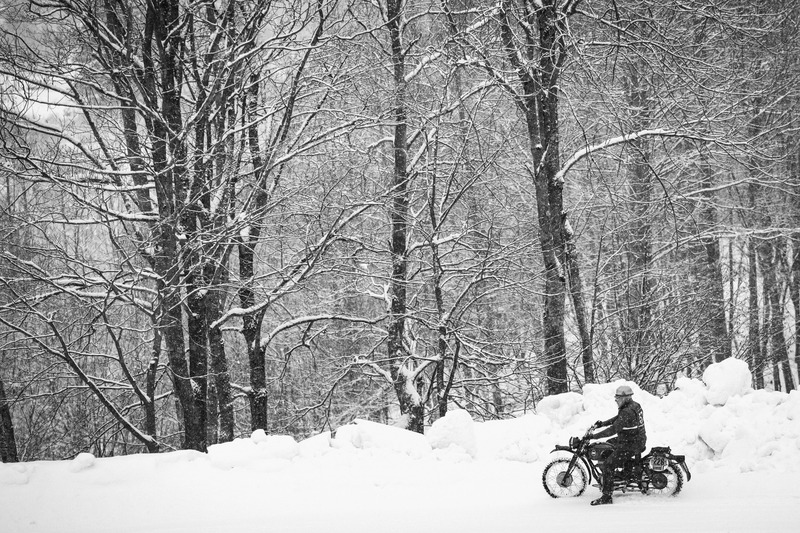 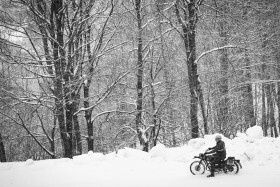 From that moment until late afternoon, lawyers, workers or waiters are no longer distinguishable, there are no Germans, or French, or Italians: only riders that are hungry for more ice and more snow, taking themselves to the limit to see just how far they dare go. 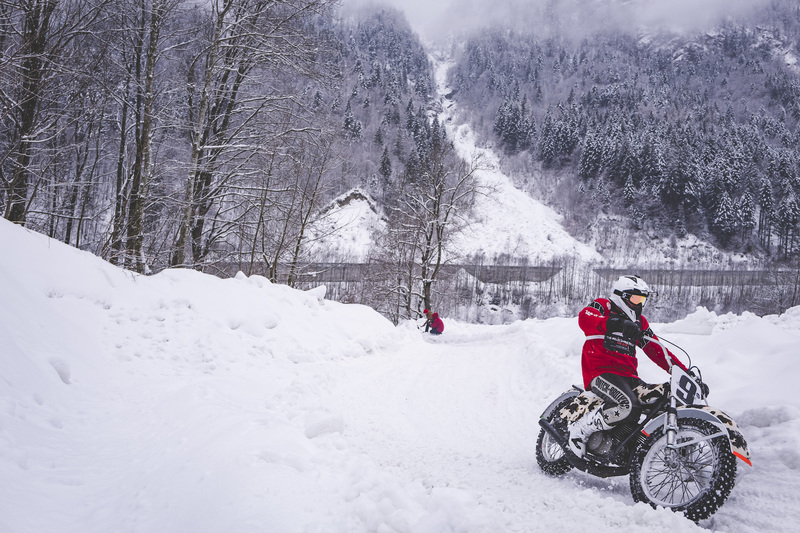 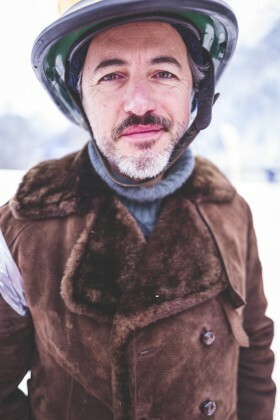 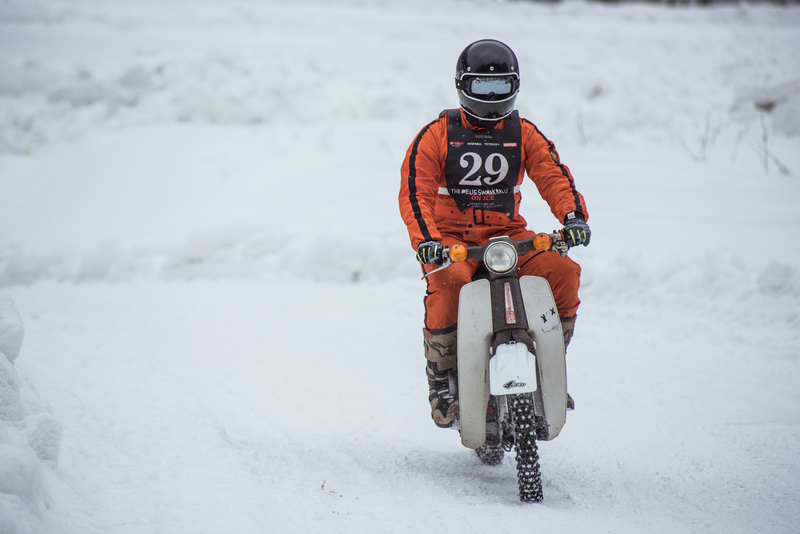 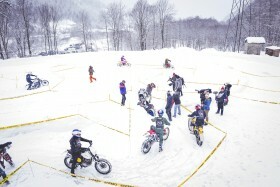 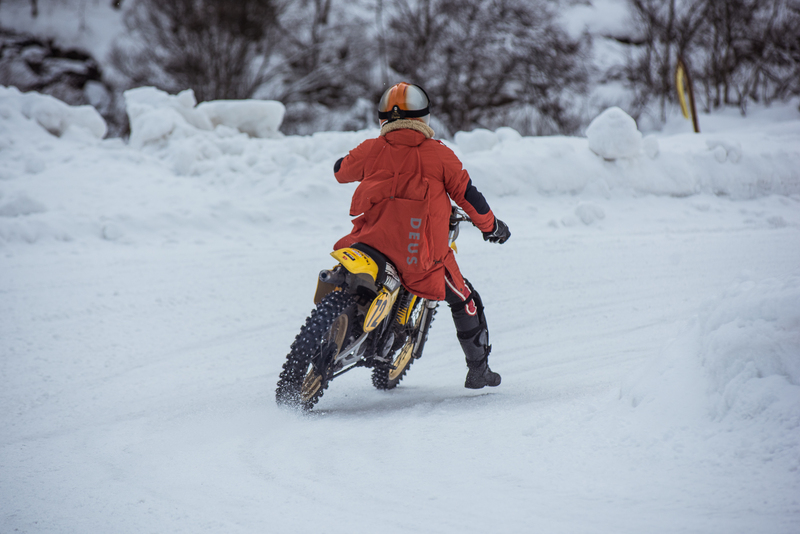 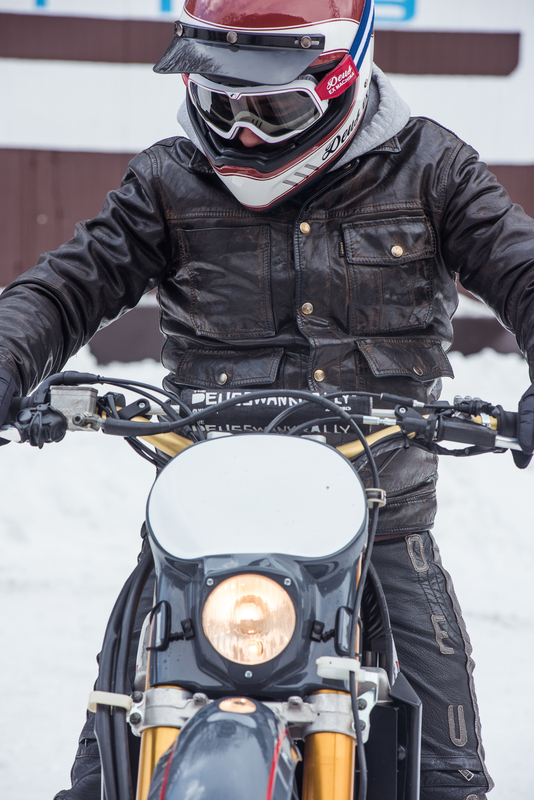 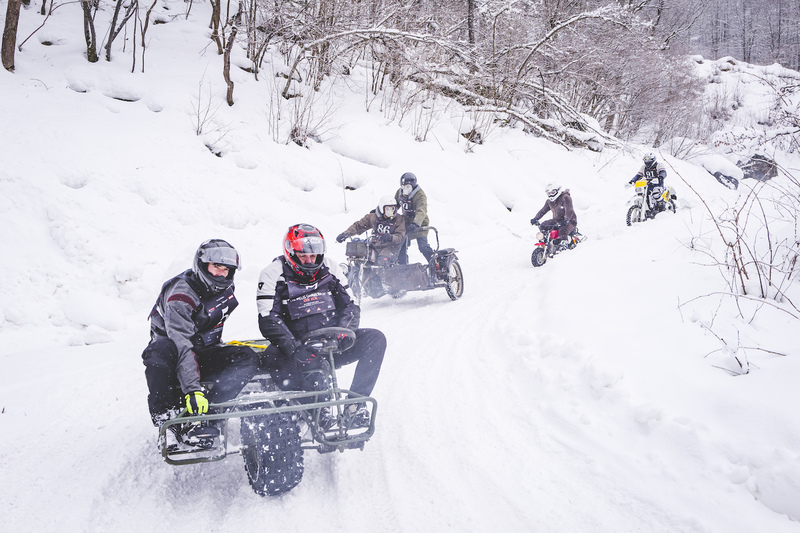 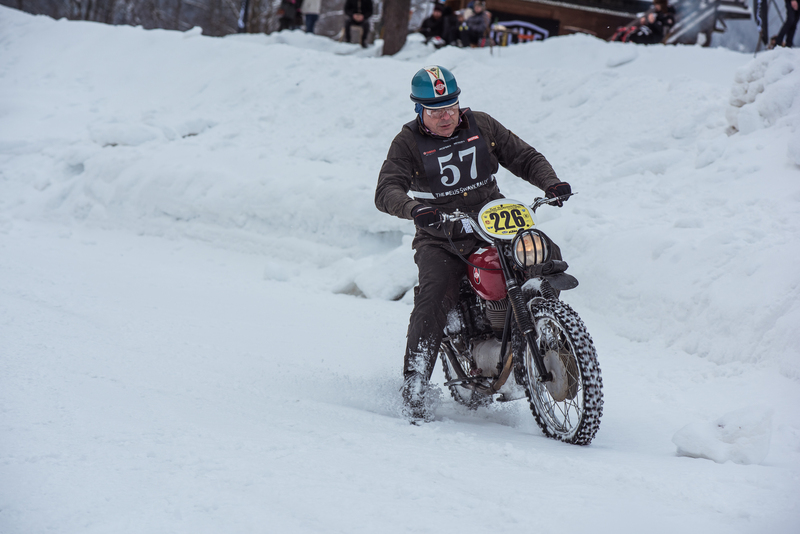 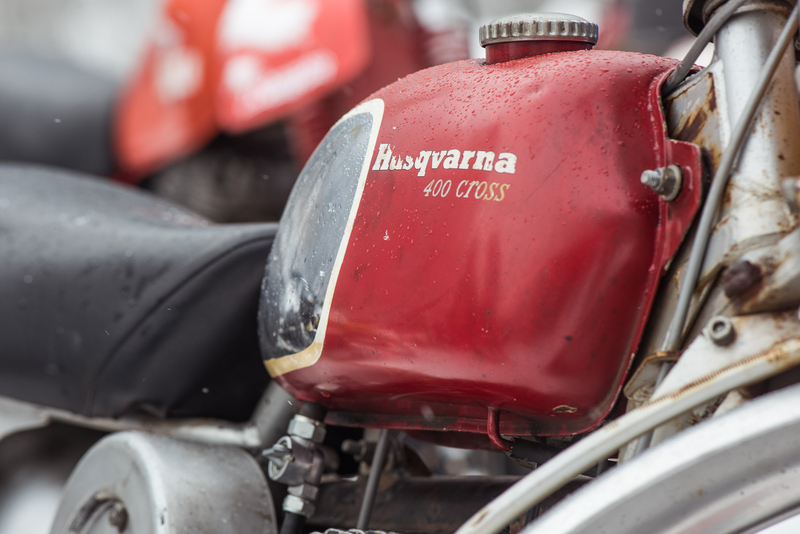 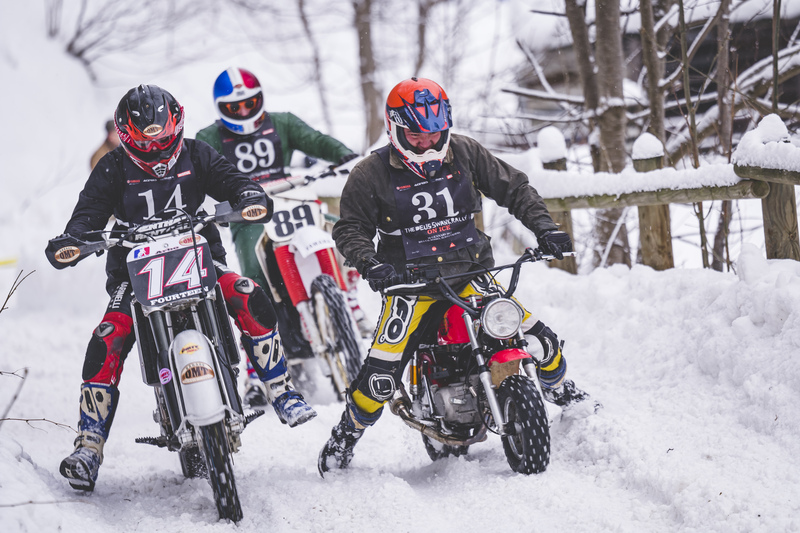 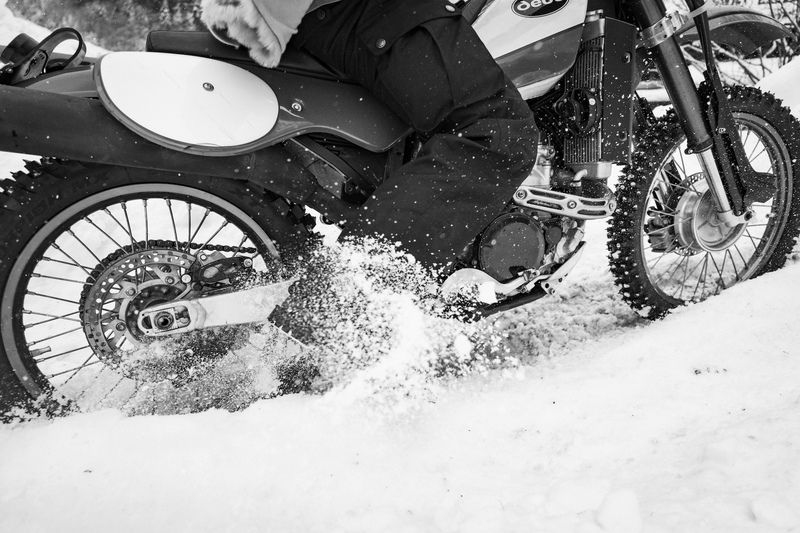 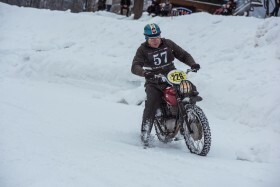 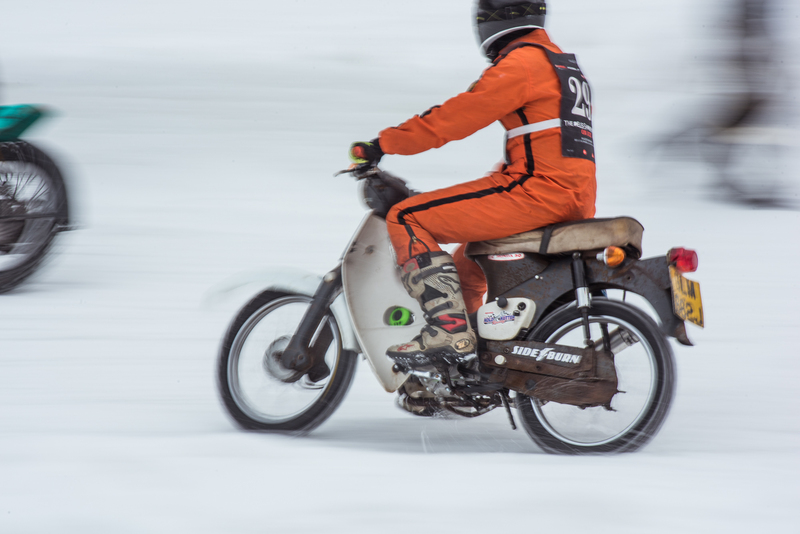 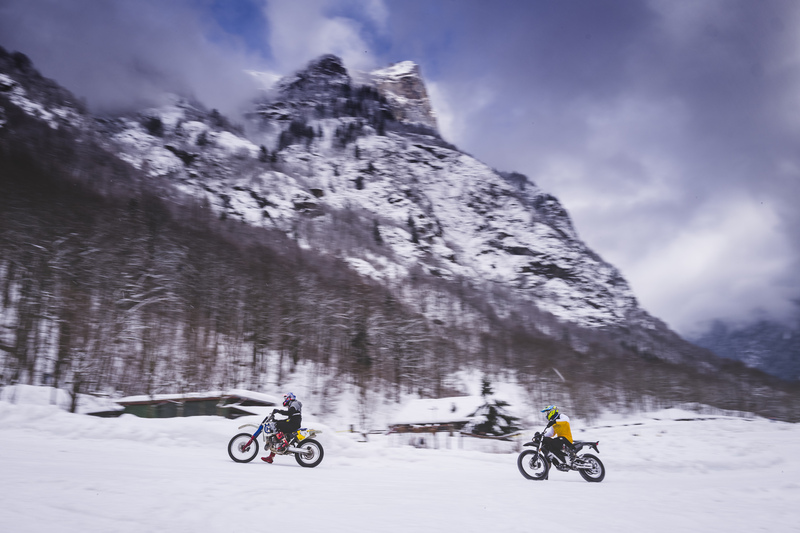 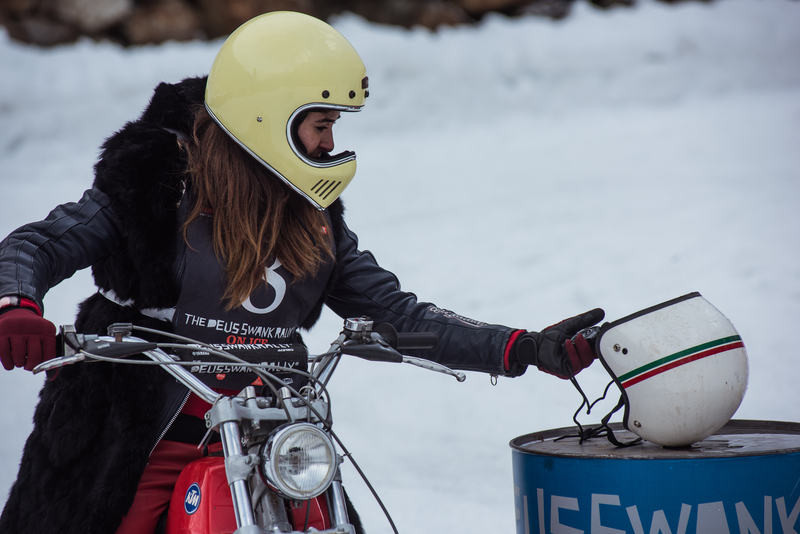 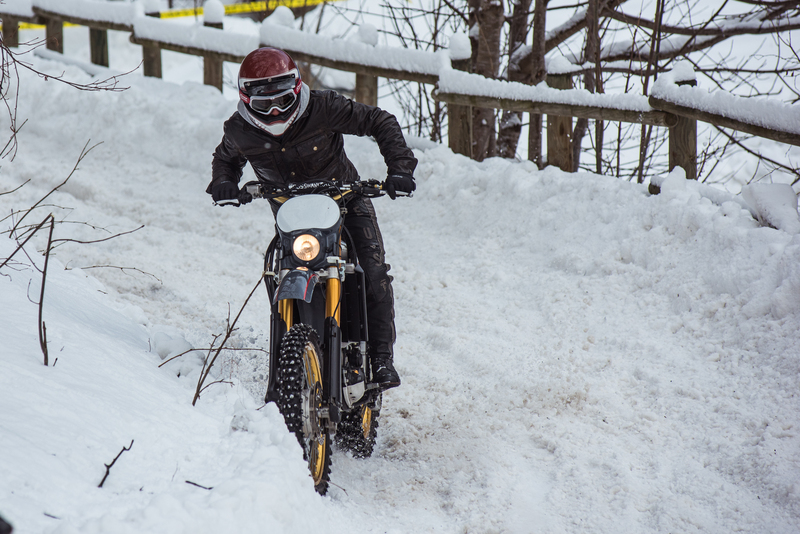 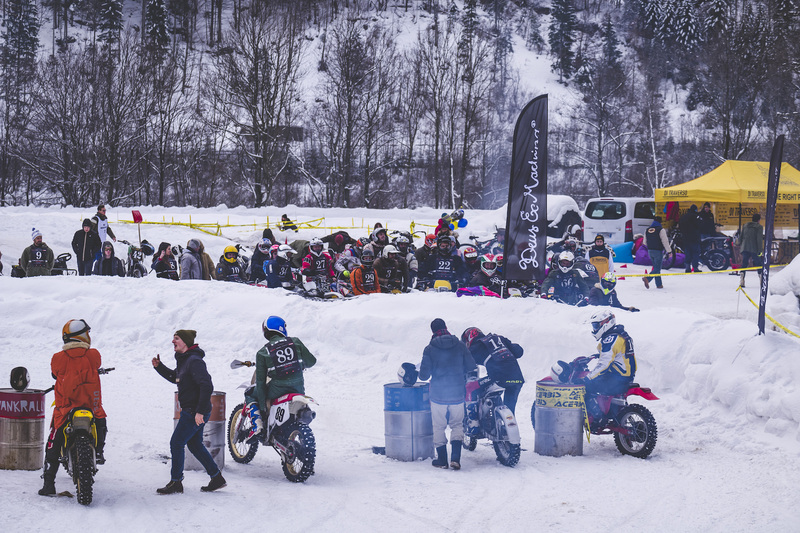 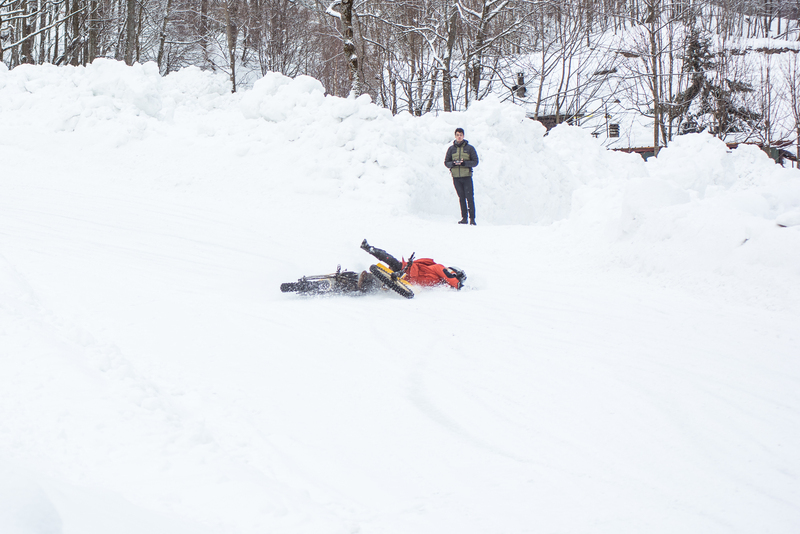 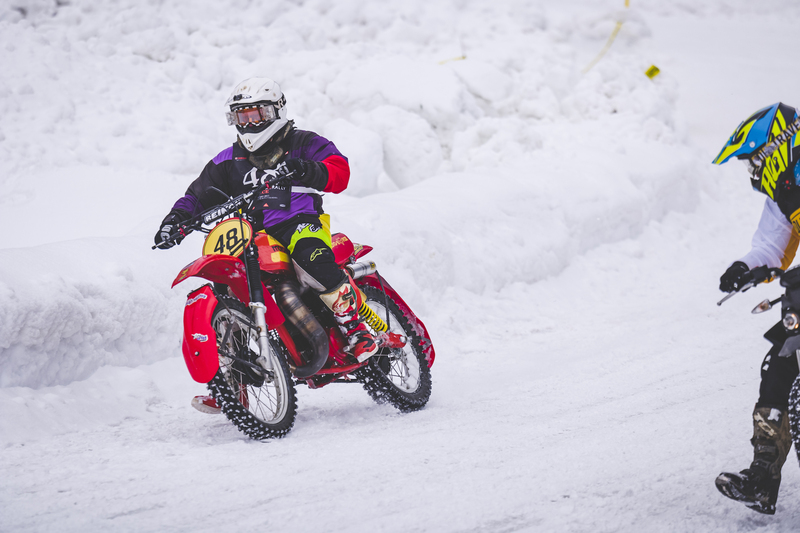 The fun begins immediately after starting the stopwatch on the icy stretch of track, with two curves that end in a first small straight followed by a sharp bend on which the motorcycles are practically sidestepping. 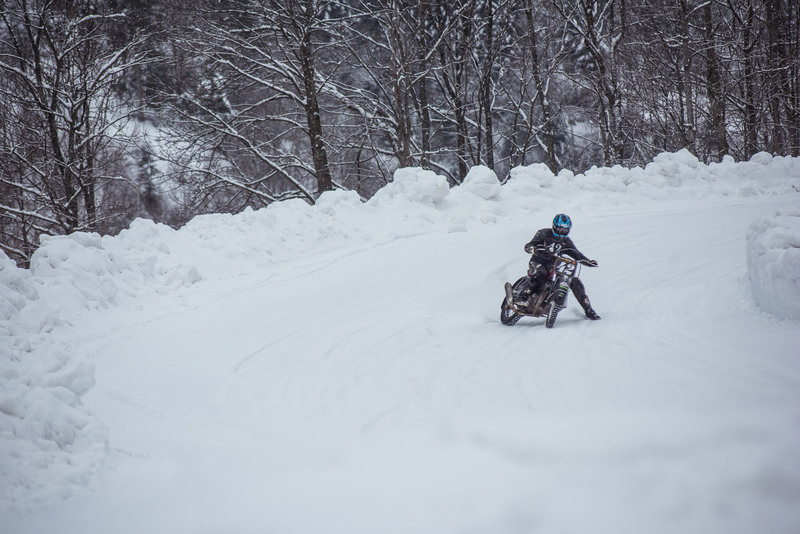 It then descends into three bends where some show superlative control and others just seem crazy, and then enters a long straight. 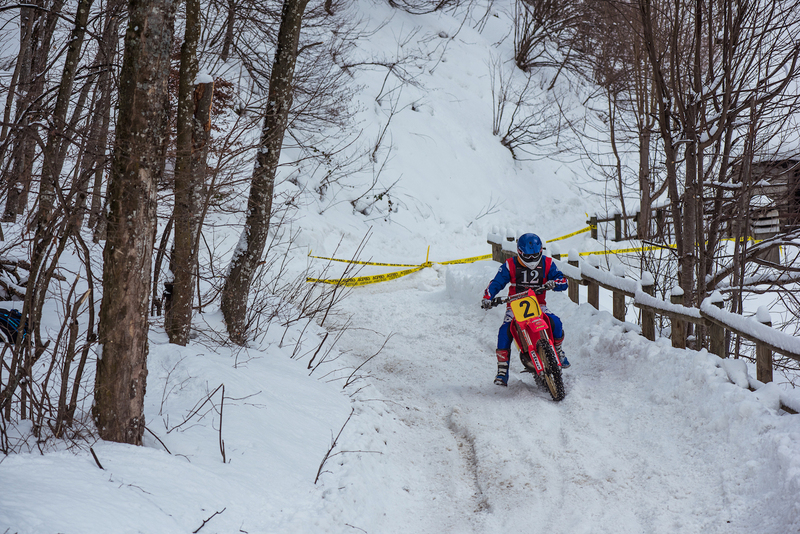 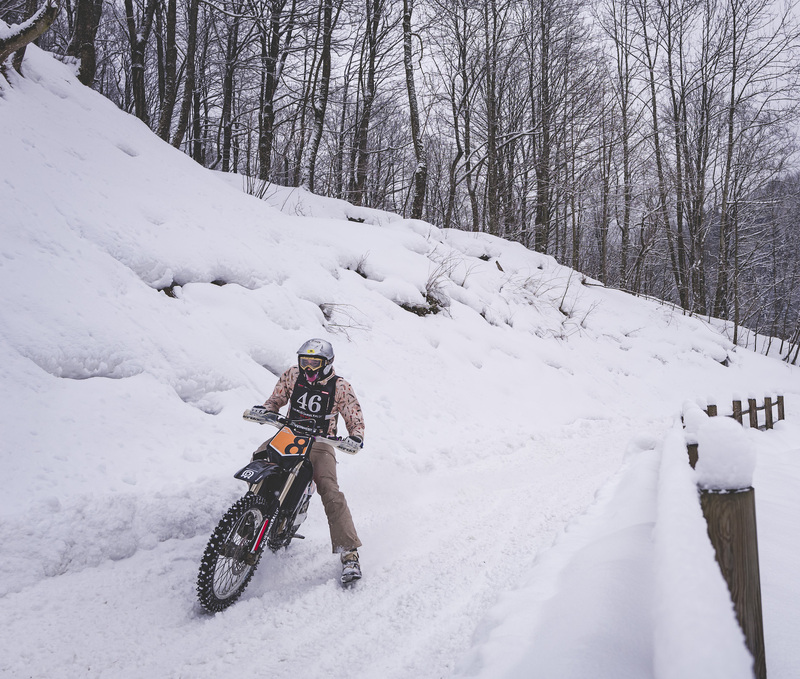 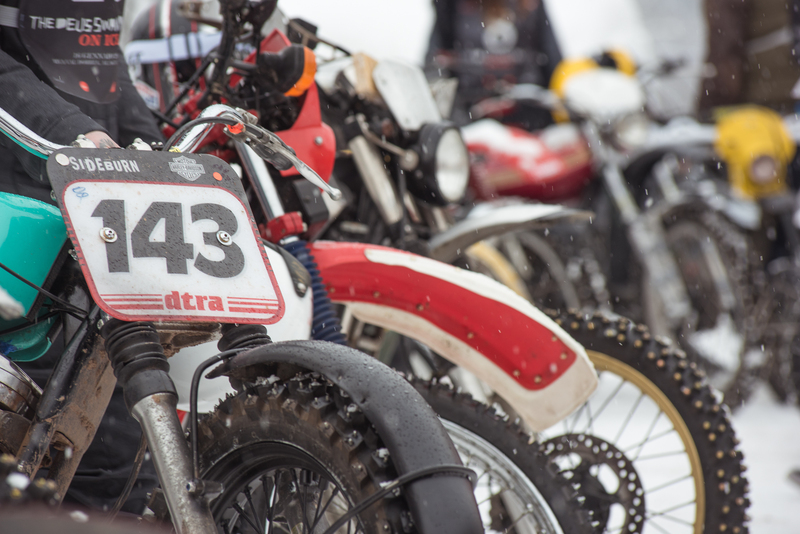 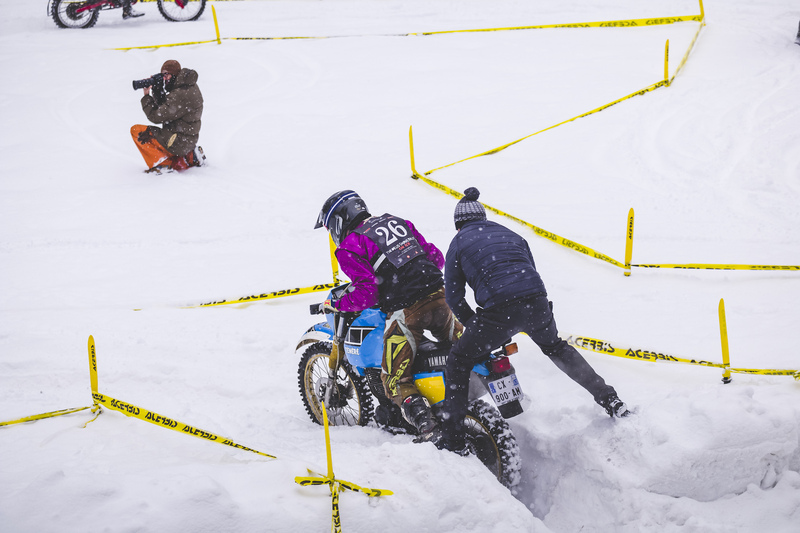 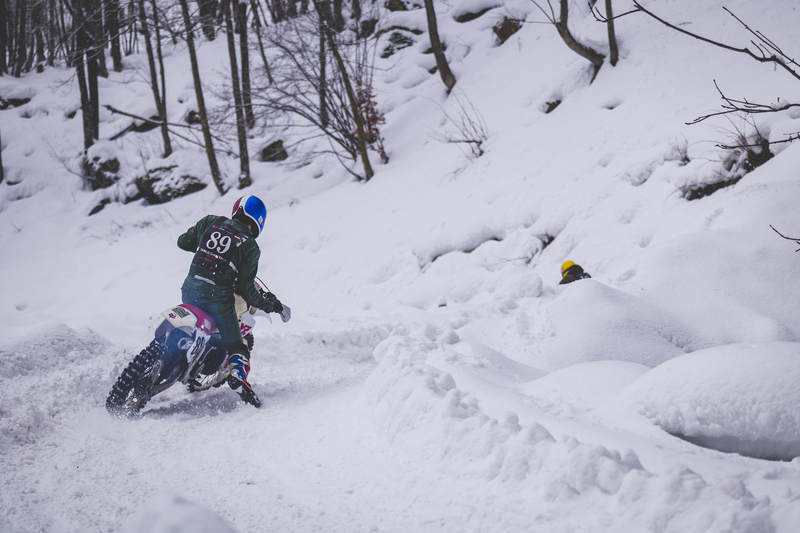 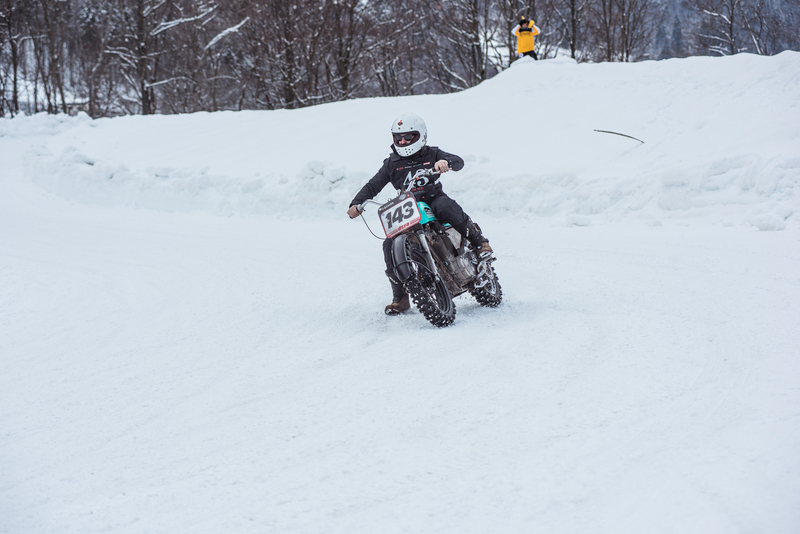 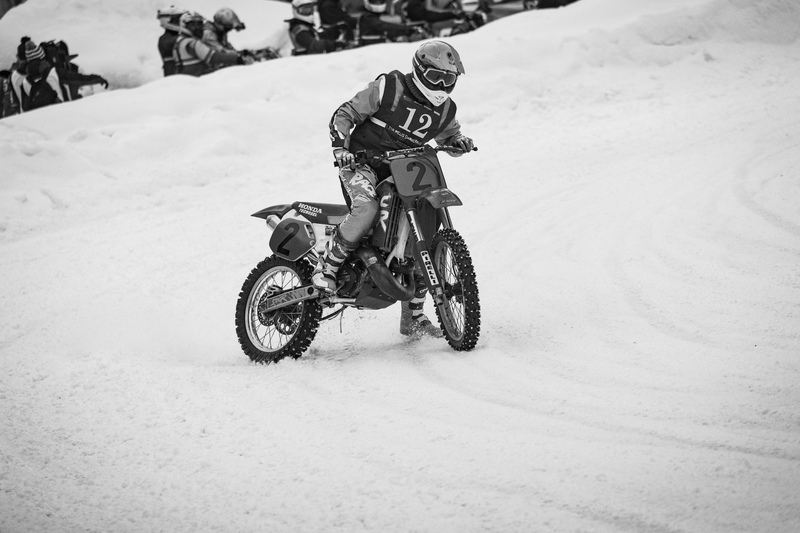 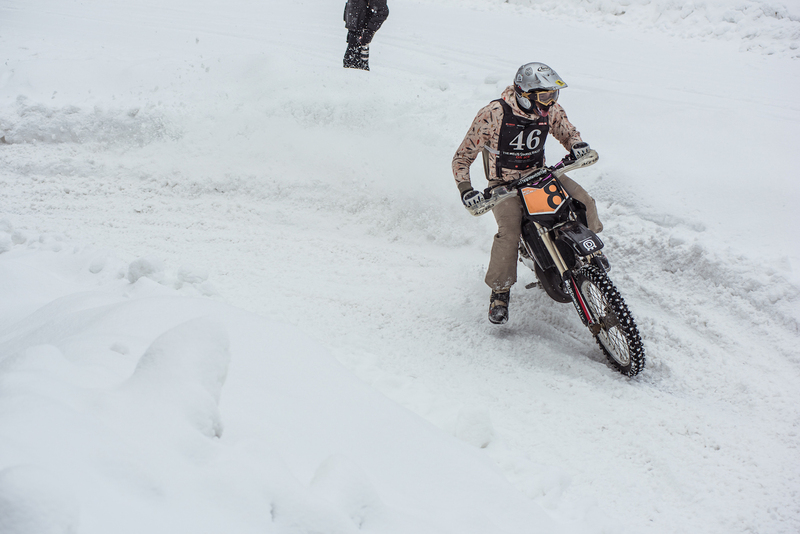 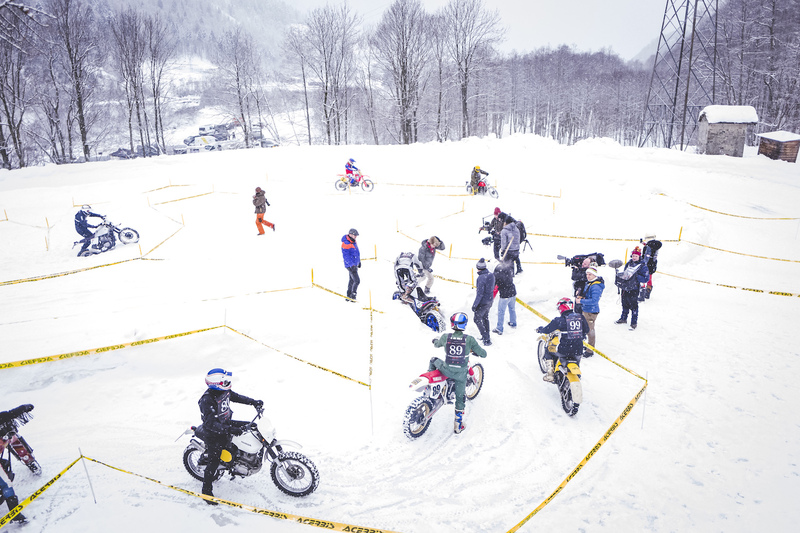 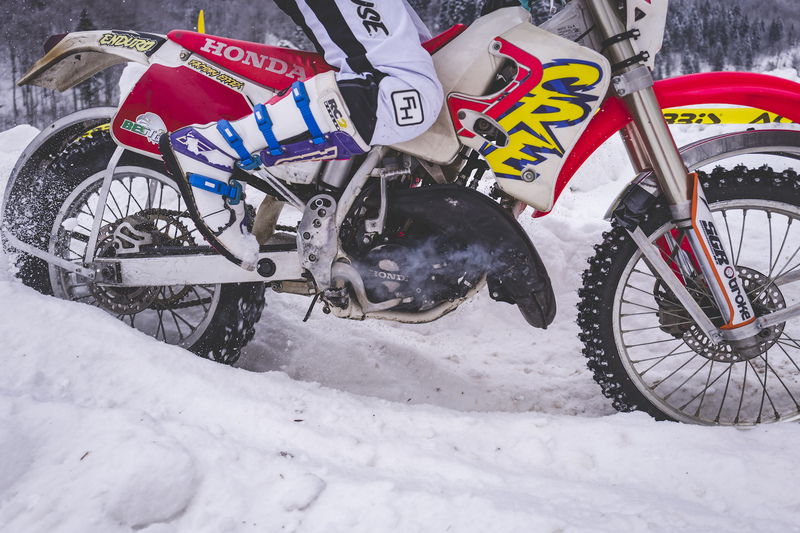 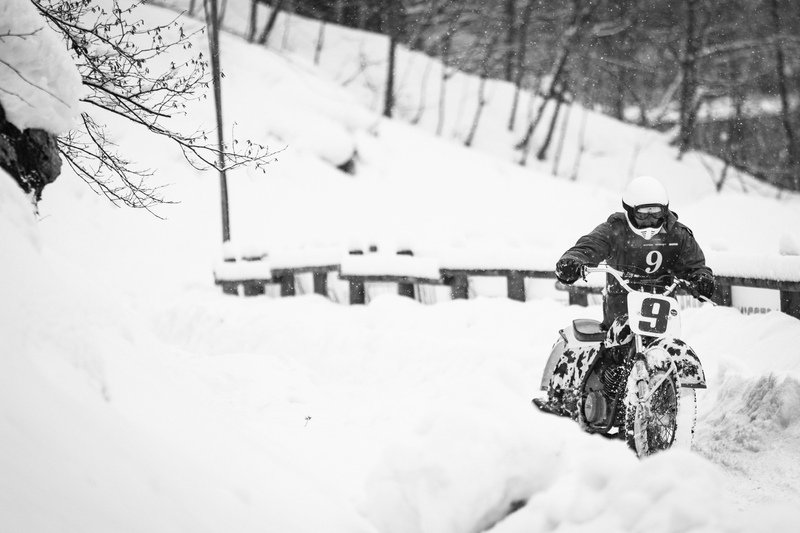 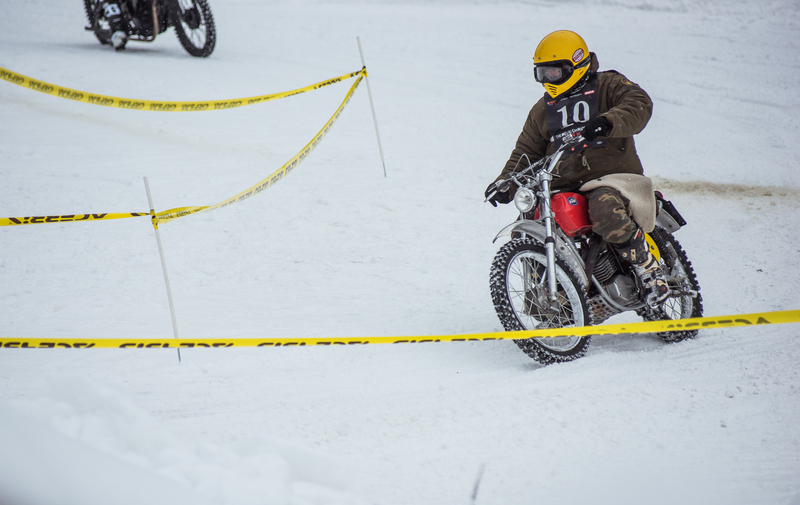 From here, after a wide curve, two bends marked Hard and Soft mark the passage into fresh snow, off track in a typically Enduro stretch that puts the studs and some of the riders in serious trouble before returning to the track to stop the stopwatch. 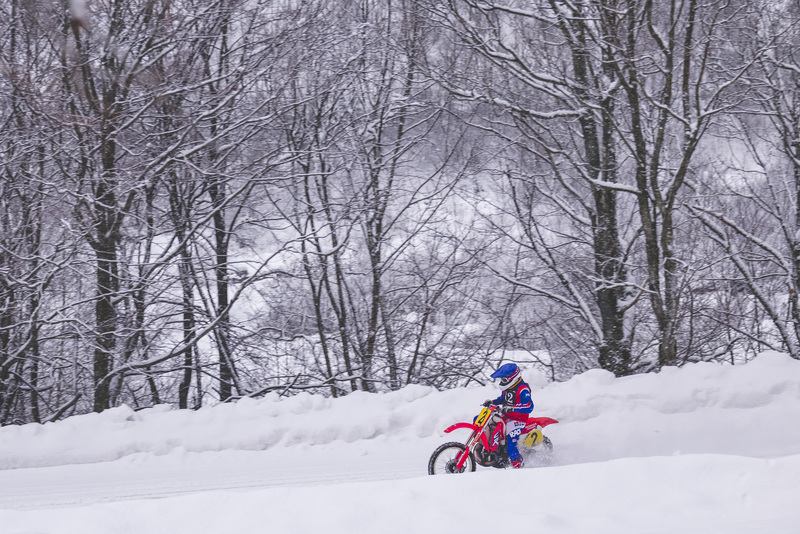 It’s a bit like going back to childhood, where fun is the only thing that matters and the only shadow over the day is knowing that it’ll have to end. There have been falls, bikes stuck in mud, riders left on foot, but most of all smiling faces, pervaded by the spirit of the Swank Rally. 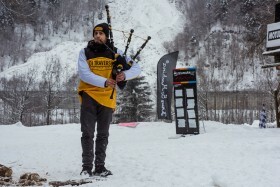 After 186 laps, the snow awarded the Greek Giannis Trigas the first place, followed by Adelio Lorenzin and Sandro Tramelli. 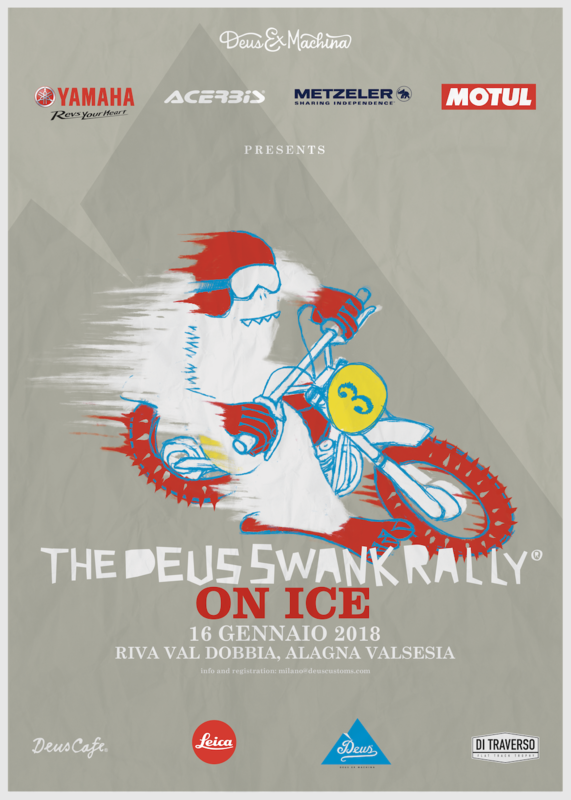 Lo Swank Rally On Ice è una di quelle giornate in cui non c’è ieri e non c’è domani. 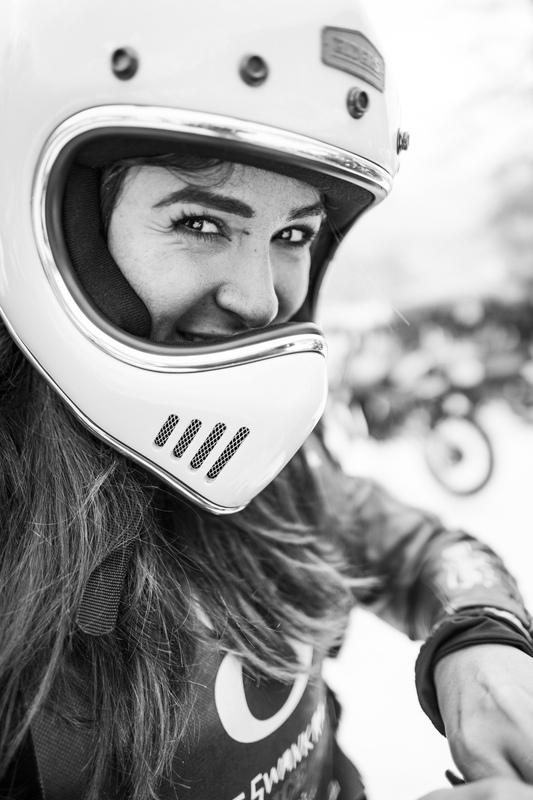 Ci si lascia alle spalle tutto, casa, lavoro, problemi: la sfida che conta è una sola e gli unici amici che hai sono i chiodi avvitati alle gomme della tua moto. Ben 53 eroici piloti da tutto il mondo hanno sfidato il ghiaccio dell’ Ice Rosa Ring alle pendici degli impietosi 4634 metri del Monte Rosa. 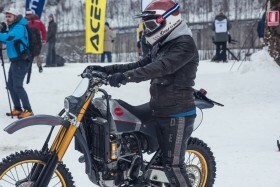 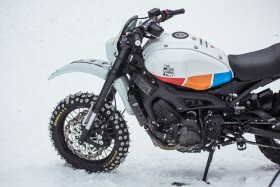 I motori hanno sfilato dalla mattina nelle prove libere, dove un fettucciato in neve fresca ha avuto la meglio su molte delle moto presenti. 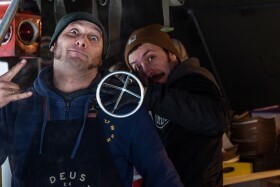 Mentre i motori si riscaldavano lo staff del Deus Cafe rosolava le prime salsicce e si preparava a scaldare le menti e i corpi con il vin brulé mentre la gara veniva nel frattempo preparata, con il supporto della Di Traverso School. 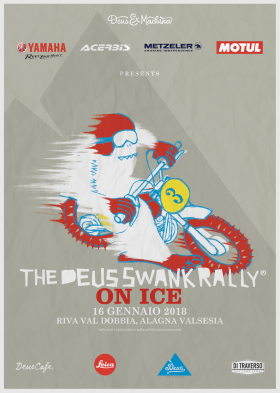 Arrivato il pomeriggio il Rock n’ Roll del campo ha scandito i minuti e ha dato la carica per la gara ad autocronometraggio, aperta dalle tre cazzutissime ragazze che figuravano tra gli iscritti. Da quel momento fino a tardo pomeriggio sulla pista non si son più visti avvocati, operai o camerieri; non si era né tedeschi né francesi o italiani: solo piloti affamati di altro ghiaccio e altra neve e si son portati tutti al limite per capire fino a dove si potesse osare. 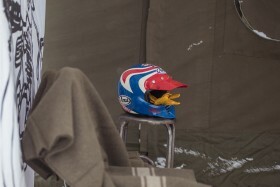 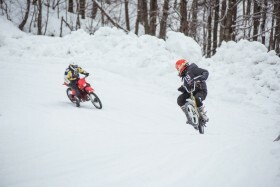 Il divertimento cominciava subito dopo aver fatto partire il cronometro sul tratto di pista ghiacciata, con due curve che finivano in un primo piccolo rettilineo seguito da una curva a gomito su cui ci le moto si intraversavano a meraviglia. Si scendeva su tre tornanti in cui alcuni hanno dimostrato un gran manico e altri di essere dei folli, per entrare in un lungo rettilineo. 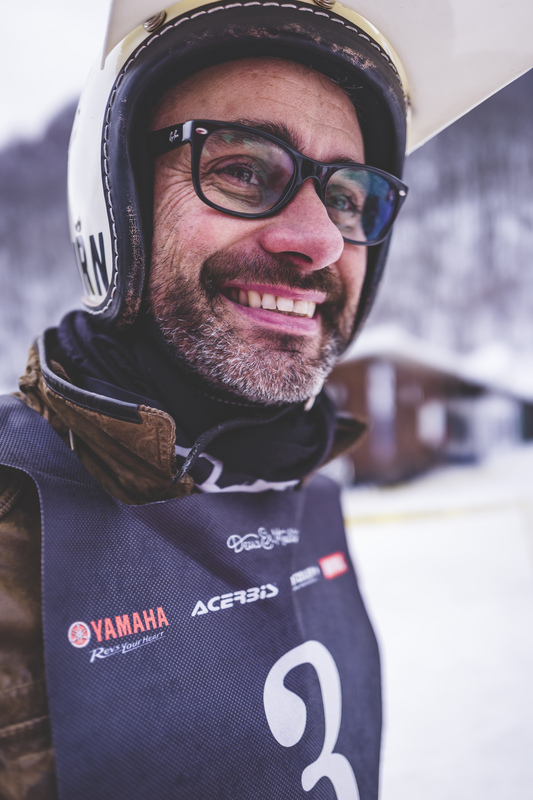 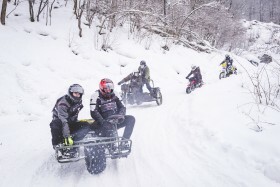 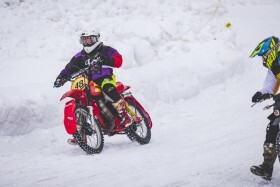 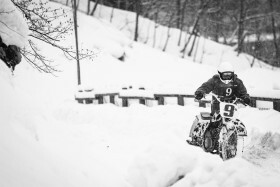 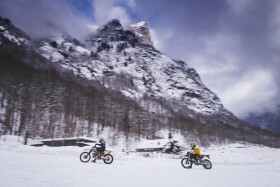 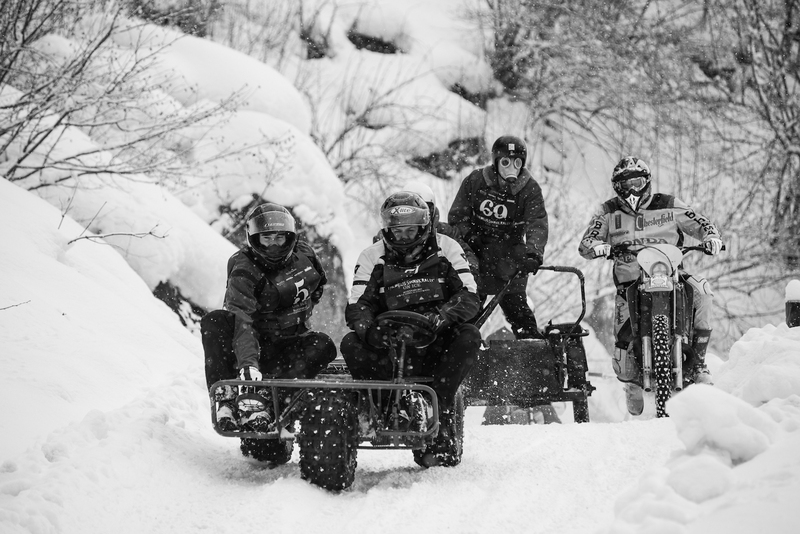 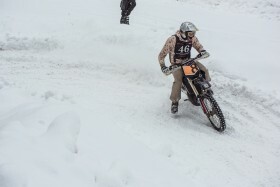 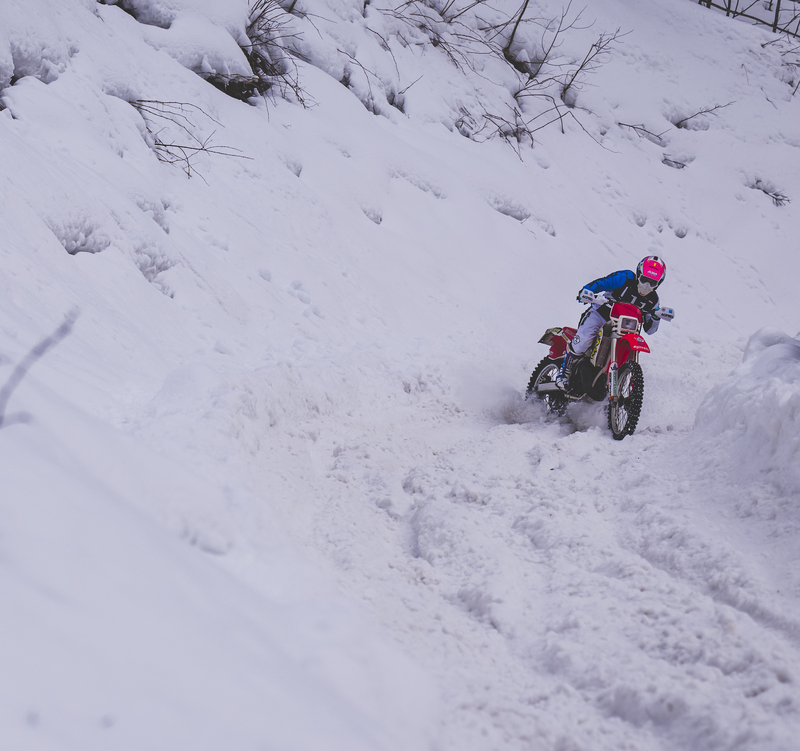 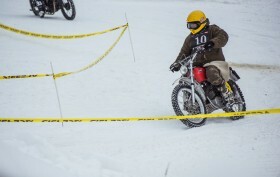 Da qui, dopo il curvone due varianti Hard e Soft segnavano il passaggio in neve fresca, off track in un tratto tipicamente Enduro che ha messo in seria difficoltà i chiodi e alcuni dei piloti prima del rientro in pista per fermare il cronometro. E’ stato un po’ come tornare tutti bambini quando il divertimento era l’unica cosa che contava e l’unica ombra in tutta la giornata era la coscienza che sarebbe finito dopo poche ore.
Ci sono state cadute, impantanamenti, piloti lasciati a piedi, ma più di tutto facce sorridenti, pervase dallo spirito dello Swank Rally. 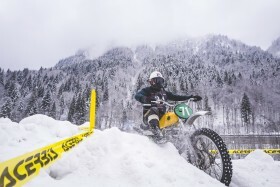 Dopo 186 giri di pista, la neve ha premiato il greco Giannis Trigas al primo posto e a seguire Adelio Lorenzin e Sandro Tramelli.